This post is part of my reflection on an upcoming talk I’m giving at Douglas College about open pedagogy: “What’s Open about Open Pedagogy?” I an earlier post I started collecting some examples of activities that people have put under the umbrella of open pedagogy. Then I did some reflecting on possible differences between open pedagogy and open educational practices . In my last post I looked at open education in the 60s and 70s. Here I’m trying to summarize what I’ve got so far around open pedagogy. This is an extension of work I did in a series of posts on open pedagogy earlier this year, all of which are linked in the last one: Navigating Open Pedagogy Part 2. In that post I did a good deal of pulling together of various threads of how people define open pedagogy, and here I’m going to try to refine it even more. So reading that post might be a useful precursor to this post, because I’m going to do some shorthand here, based on what was discussed there. I’ll also be adding some things based on what else I’ve read since then. OER-enabled pedagogy is the set of teaching and learning practices only possible or practical when you have permission to engage in the 5R activities. Access: some talk about open pedagogy as broadly helping with access to higher ed. Will they be able to read their Chemistry textbook given their vision impairment? Will their LMS site list them by their birth name rather than their chosen name, and thereby misgender them? Will they have access to the knowledge they need for research if their college restricts their search access or if they don’t have Wi-Fi or a computer at home? Are they safe to participate in online, public collaborations if they are undocumented? Is their college or the required adaptive learning platform collecting data on them, and if so, could those data be used in ways that could put them at risk? Here are a couple of lists by other people of what falls under “open pedagogy” or “open educational practices” (see my previous blog post on these two things where I try to parse how I feel about whether they are different). She argues that these attributes are tied to OER (p. 4, p. 11), such that materials used and created are open educational resources. What this model adds to my list above includes a focus on trust, such that students and faculty are willing to engage in sharing ideas and resources, through participatory technologies, and to connect with a larger community. This means a supportive environment, not where there is no criticism, but where it is constructive and respectful (if it exists), and where the atmosphere is one of helping each other to learn. It also adds innovation and creativity, though students co-creating or revising or independently creating OER could fall under this. Finally, the focus on peer review isn’t directly reflected in my earlier list, though connecting with other students and a wider community could involve peer review. 1. open = agency — Learners are individuals and independent agents within the learning process. They are allowed to operate independently and explore with personal freedom. 2. open = choice — Learners choose their own pace, their own direction, and their own connections. 3. open = expansion — The learning network is an open-ended and ever-expanding network of nodes. Each node in the network represents is a connection, a possibility for learning. Everything in the network is a project. 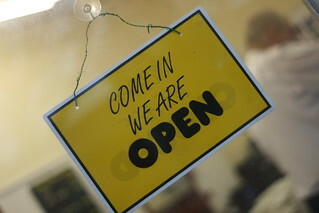 4. open = creativity — Openness translates to rich possibilities that inspire new perspectives and ideas. 5. open = student-constructed — Learners take responsibility for their learning networks and are active participants in its planning and growth. 6. open = open-ended problems — Learning design is focused less on specific outcomes or competencies than on process. It is about empowering learners to create real solutions to real problems. 8. open = risk and goodness — Choosing often leads to unexpected and unpredictable results. While there is risk associated with the unknown, there is even greater reward and goodness. Some new things that this list adds are the last three, numbers 6-8. Open-ended problems and unmeasurable outcomes seem related to me, though I suppose you could possibly have the latter without the former (or vice versa). I see the point about unmeasurable outcomes also being tied to student agency and autonomy, because it’s hard to determine in advance what the outcomes of learning are going to be if what students learn, and how, is at least partly determined by their own agency. I like the focus on risk here in number 8–that’s really critical to remember. When we ask students to connect with larger communities, to contribute to public knowledge, to have more agency in their learning, this means taking risks. It is also risky for faculty who don’t have as much control over how courses go. And if some students don’t react well to what is often a significant change in how they’re used to learning, then there is the risk of negative student evaluations that can sometimes have serious consequences. However, the way number 8 is put here, it sounds like the more risk the better the “goodness,” which isn’t always the case. Sometimes risk leads to danger that outweighs potential benefits; e.g., what about the undocumented student whose status gets publicized, even inadvertently, as a result of public postings on blogs, social media, or other platforms? In my last post I took some notes on articles & chapters about the open education movement in the UK and North America (maybe elsewhere too?) during those decades. Here is a list of some aspects of “open education” from that time that I gleaned from the few things I read. Similarities between then and now, I think, are mostly in terms of student agency, autonomy, choice, and sharing of power and authority. What today’s “open pedagogy” adds are things that didn’t exist before, or may be easier with 21st century technology, such as: open licenses, larger connected communities (made available through the internet), more of a focus on free or low-cost materials, students contributing to bodies of knowledge for others (including the public). So though I doubt the history is direct–the modern open education movement probably didn’t emerge directly from the previous one–there are still ways the two have come together around some shared values. I expect there are histories of open education that show the connections and deviations much better than I can with my small amount of reading so far. Posted in Open Access, open ed, OER and tagged open educational practices, open pedagogy on October 25, 2017 by Christina Hendricks.